Bring Bluetooth music, navigation and call functions to any car thanks to the Paplio from BlueStream. With this tiny device, any car can get an upgrade to lets you stream music from your phone at full MP3 quality, as well as take phone calls and receive navigation directions, all without tying your phone down with AUX cables. For most phones, Paplio is ready to connect just seconds after it is plugged into USB power. No pressing buttons to connect! Just open your phone's Bluetooth menu to pair, and after pairing the Paplio will connect automatically whenever your phone comes in range. Please note that due to the wide range of cars, phones, software configurations and operating conditions, a small number of devices may have trouble reconnecting automatically. At just over an inch long, the Paplio is smaller than a regular size USB flash drive. 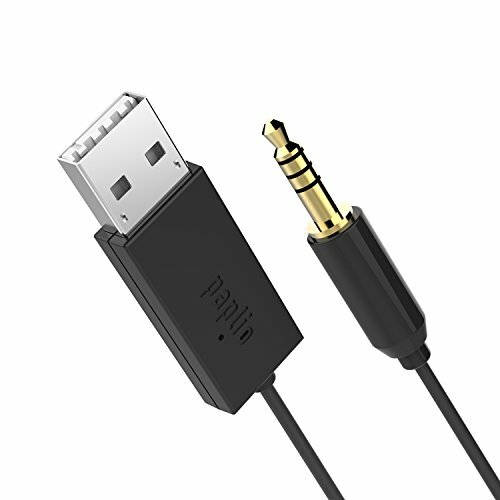 Despite its size, it has great range and comes with a 28" / 72 cm AUX cord attached. - Microphone is located on the device itself and it must be within range of your voice to pick up sound. - Some cars' USB power turns off when little or no power is used by the connected device. As Paplio takes very little power, your car may think nothing is connected. Please use a USB car charger / adapter to provide USB power if you encounter this problem. - Paplio works with most phones, tablets and laptops. If you experience difficulty, please contact the seller for assistance. - May not work with Siri, OK Google or other virtual assistants. - Not compatible with BLE (Bluetooth Low Energy). - Not suitable for watching video, as audio may not be in sync. USB POWER - Conveniently power your Paplio anywhere using any USB charger, cigarette lighter adapter, USB port, etc. If you have any questions about this product by Paplio, contact us by completing and submitting the form below. If you are looking for a specif part number, please include it with your message.